The CoffeeShop Blog: Don't Kill Weeds, Eat Them! And More Fun Projects at the CoffeeShop Crazy House. Don't Kill Weeds, Eat Them! And More Fun Projects at the CoffeeShop Crazy House. It is spring here in our part of Texas. Actually it has been spring all winter, we had only a few day where the temperature was freezing. I am not complaining. With spring comes spring cleaning and Paul and I are working on organizing and cleaning our multi-purpose room on the third floor. The attic space of our house has been partially built out with an interesting shaped living area. We use this space for my office and sewing room as well as an exercise room, video game room, guest room, and flight simulator room. This area has become cluttered and needed to be cleaned, organized, and dusted. So we spent our weekend working on it. Thus my poor computer has been unplugged and I haven't had any time to make my Monday freebie. So today I wanted to write about the many creative projects we have been working on these last weeks. The boys and I were responsible for pulling weeds in our yard. 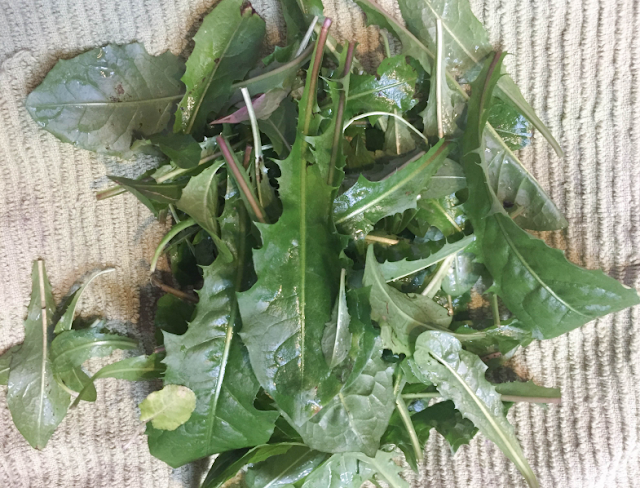 Thanks to the internet we realized that dandelion and hawkweed are both healthy edible greens. So basically our "weedy" yard is a wonderful garden full of healthy veggies. I told the boys we were going to learn how to forage in case there is ever a zombie apocalypse. 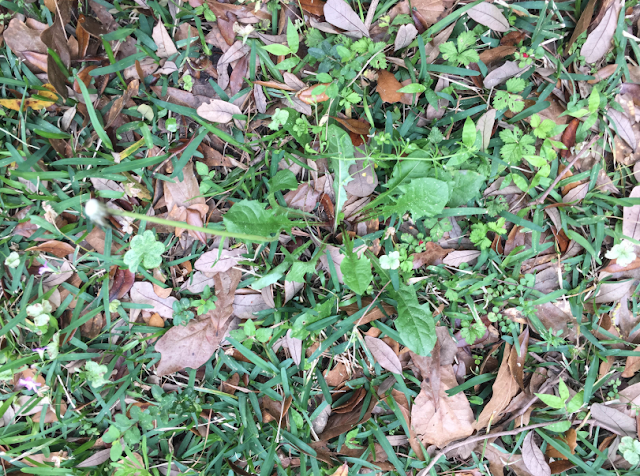 Thanks to "Walking Dead" I am now eating weeds in my yard. We cleaned and roasted the dandelion roots and made some tea. Pretty yummy. The boys planted their container herb garden and we dried some peppermint and stevia leaves and made more homemade tea. Weak but yummy. We are going to be very civilized during the zombie apocalypse and have our daily cuppa tea while on the run for our lives. A salad is only as good as its dressing, right? Many vitamins in lettuces are fat-soluble, so you need healthy oils on your greens. I hate buying salad dressing from the store as even the "best" (this means you, Paul Newman brand!) has yucky cheap oils like soybean/canola, lots of sugar, and questionable chemicals. So I did some research on the internet and figured out how to make the most delicious homemade blue cheese dressing. 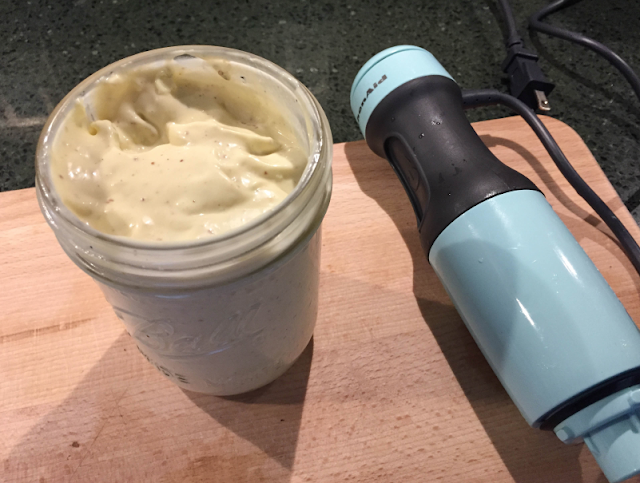 This recipe takes only a few minutes with my magical immersion blender. It has olive, avocado, and coconut oil, an egg, spices, and lots of crumbled blue cheese. I can replace the blue cheese with any cheese or leave it out completely, but I do love extra-creamy blue cheese dressing. I will write a post later on how to make it. It is not only super easy to whip up; it is so rich, delicious, AND healthy! And did I mention it is also very cheap to make? All of our glass fridge storage bowls have lost their plastic tops, so we have been using plastic wrap to cover them. I HATE plastic wrap with a passion so decided I wanted to sew up some fabric tops. At that point we had not organized my "sewing room" on the third floor and I couldn't find my sewing machine (yesterday I found it on top of the shelf covered with fabric), so I needed to find something quick and easy that didn't take any sewing. I had heard of Bee's Wrap, but it is quite pricey and I didn't want to invest in something I might not use. So I found several tutorials on making my own (this is one) and these homemade versions work incredible well. I purchased some pieces of quilt fabric squares, hand washed them in cold water, and ironed them (I hated the wrinkles). Then I sprinkled some beeswax on them, heated them at 225 for a few minutes until the wax was melted, then added some jojoba oil and "painted" everything onto the fabric. I did not use any pine resin, I didn't want my food to smell like Christmas. I used my pinking shears to fancy-up the edges, but it is not necessary. 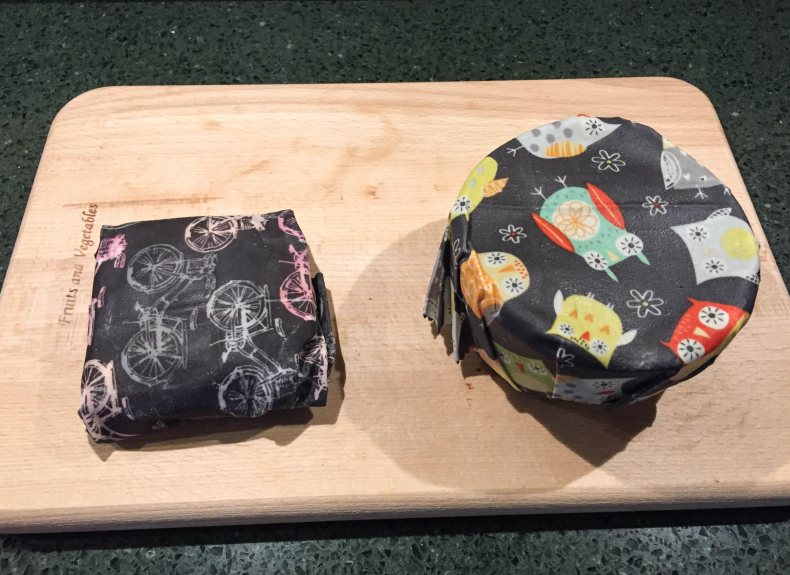 We wrap cheese (see image, on the left), and all of our glass bowls (right). As long as I take a minute to shape everything by the warmth of my hands, it sticks better than plastic wrap in the fridge. And the food is staying perfectly preserved and not drying out at all. And I can rinse and reuse them, over and over. I made twelve different sizes and spent $3 on the fabric, and a couple dollars on the beeswax. I love quick and cheap crafts that work! 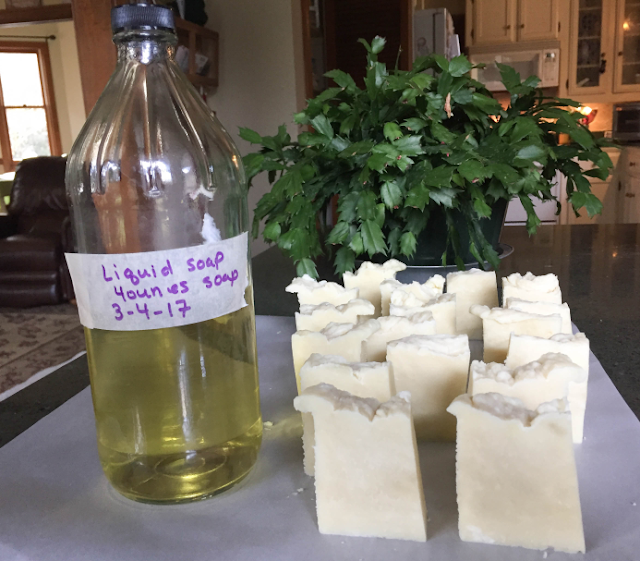 I made some homemade crock-pot laundry soap (olive and coconut oil) the other day. It works great. But I also needed some liquid soap like Dr. Bronner's. That stuff is great but pricey and I wondered if I could make my own. I found tutorials to make the real stuff and it is very time-consuming. But I found a tutorial that said you can melt shredded homemade bar soap in water for one quick and easy version. So I measured 4 ounces of my laundry soap, shredded it with my salad shooter, and added a quart of hot water. It went into solution quickly and now I have my own liquid soap! One batch of my laundry soap will make approximately 2.5 gallons of liquid soap and costs me maybe $5. I use this for the laundry, and diluted in foaming soap containers for hand washing dishes, cleaning, and washing my kids filthy hands. It has a pH around 7-8 and cleans very well. I even use it to clean my stainless sink in the kitchen and food and oil do not have a chance. My sinks are now sparkling! So these are a few of the projects going on in the Proske house. I will add that my husband thinks I am crazy and warned me he better not find any mushrooms in his food picked from our yard. ;-) He is convinced I am trying to poison him. I will write more specific tutorials on these fun hippie crafts and share them with you. Hope everyone is having a great week! I will be back creating and posting freebies tomorrow. Happy to hear that you have been having a fun productive week Rita. Glad you are still enjoying the soap making et al.